compatible with 7-10 inches around tablets, including iPad, iPad mini, Samsumg Galaxy Tab, Google Nexus, Microsoft Surface, etc . Adjustable anti-slip clamp fits 6-8 or 9-11 inches tablets. 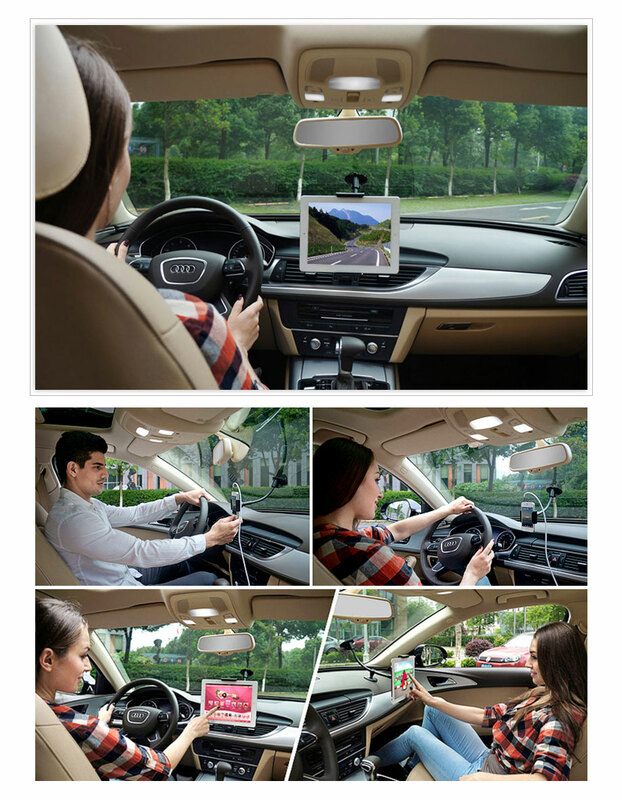 Strong Suction-Cup with Lock-Clip, enhance the stickness. Support foot-plate provides double securement. 3.5-5.5 inch Cellphone Clamp as free gift. I had no idea this also comes with a cell phone clamp, it fits all my mounting needs for my iPhone,Galaxy S4,iPad and Galaxy tabs…I save a lot of time and money to find a universial car mount for all my devices!Perfect!! I'm looking for the winshield mount for tablets but most are cell phone mounts in market, this one is excactly what I'm after. I have iPad mini and Nexus 7, both can mount very well with the clamp,what a life saver! Definitely no problem to hold my iPhone, but the tube is shorter than my expected, actually my nexus 7 was installed on the dashboard…,with the support foot, yeah it's not a problem. Comes with a tablet clamp and cell phone clamp, the support foot is necessary when you mount a tablet on the screen, the brackets are very sturdy and strong enough, recommend. I was expecting this will hold my iPad well in the car front, but it's too short and became a stand above the dashboard, it's pretty good for iPhone though. It's a powerful mount, my electronic devices, iPhone, iPad, GPS, iPod…all sits very cool on this little mount gadgets, another powerful car accessory. The long rail is sturdy, clamp is awesome,but not long enough if you want to put iPad lower and not block any views, works perfect for my iPhone though.